Willis, Thomas H; Mixed Media Marine Painting, Steam-Sail Racing Yacht Mayita. 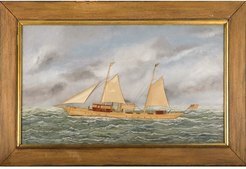 Thomas H. Willis oil on canvas with silk work marine painting, Steam-Sail Racing Yacht Mayita, circa 1896; image credit on full record. Thomas H. Willis (American, 1850-1925) oil on canvas with silk work marine painting, Steam-Sail Racing Yacht Mayita, circa 1896 [mixed media].